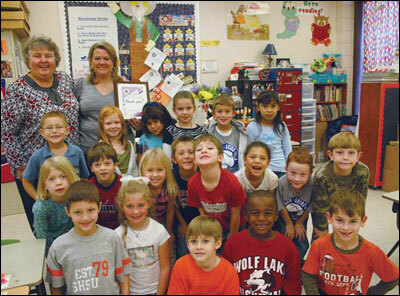 Love For Educating The Young: Anderson-Shiro Elementary teacher Dana K. Wagner displays a 2009 Distinguished Educator of the Year award from Sam Houston State University with her proud first grade students. Also pictured is Principal Debbie Lynn, who wrote a letter of recommendation on behalf of Wagner. First grade teacher Dana K. Wagner of Anderson-Shiro Elementary has been chosen as the 2009 Distinguished Educator of the Year by Sam Houston State University. Wagner is the third local educator to receive recognition in about a year’s time. Anderson-Shiro Junior-Senior High School Principal Brandon Core was recently honored with the Paul R. Hensarling Distinguished Graduate Student Award by the Texas A&M University Department of Educational Administration and Human Resource Development and in November 2007, Superintendent Dr. Fred Brent was the first recipient of the Hoyle Award in Educational Leadership, presented by its namesake, John Hoyle, professor of K-12 administration and chair of Texas A&M University’s Administrative Leadership Institute. Lynn said parents constantly request Wagner as they hear other parents rave about how special she made their child’s first grade year. “The most wonderful part about Dana is she sees strengths in everybody, whether it’s a student or a teacher, and she builds on that. I’d love to have 50 of her. Her enthusiasm is very contagious and the rest of the staff have great respect for her,” said Lynn. Wagner began her teaching career at the school after an invitation by former Principal Dr. Chesley Ketchersid in August 1994, just one year after she graduated from Sam Houston. Since Wagner was working on her masters and said she initially wanted to teach fifth or sixth grade, she attempted to turn down the position. Fortunately, the former principal was persistent and Wagner agreed to take the position on a temporary basis. Fifteen years later, Wagner said she wouldn’t trade being a first grade teacher for anything in the world ” including a position as principal” as she attempts to pass on the gifts of self-confidence and the belief that anything is possible to her students. Wagner said the first step in making a difference in a child’s desire to learn is to establish a personal connection. Her belief was reinforced by a Capturing Kids Hearts workshop Superintendent Dr. Fred Brent sent her and other teachers to just two years ago. “The philosophy is that in order to capture a child’s mind, you have to capture their heart first. That’s how I teach. I spend the first week of school making a connection with them,” explained Wagner. Since Wagner believes the children will get to know each other very well as fellow students for the next 13 years, her mission is to get them started on the right path together. “Basically, I try to provide a family-like environment with camaraderie and compassion so they know we’re family and we take care of each other,” said Wagner, who makes it a point to begin each morning by greeting students at the door with a handshake and a smile. “This is my moment to connect with each and every one of them. At that instant, I can tell if they are having a good morning, or if something is just not right,” said Wagner. Throughout the school day, Wagner said she doesn’t hesitate to interrupt her lesson plan and teach based on students’ interests. Recently, Wagner noticed a student’s interest in the Statue of Liberty and offered him a related book to read. She then asked him to become the class expert on the subject and let the child’s parents know that he did not have to follow through if he changed his mind later. Not only does Wagner assist Lynn in making sound decisions by providing background information on a range of topics, she also helped further the education of elementary students by prompting the principal to start an enrichment program last year. As a result, the school day was extended by 30 minutes, which allows instructional assistants to teach students that are on-level or above to learn about topics above and beyond the classroom level. “Many of our instructional assistants have a wealth of knowledge about things outside of the classroom,” added Wagner. The extra time also helps students that are in need of tutorials to work with the classroom teacher one-on-one without missing classroom instruction from being pulled for special classes. Through the years, Wagner has continued to strive to support her students by attending extracurricular activities, such as sports events, dance recitals and even funerals. She even participated in graduation ceremonies as she wore her college cap and gown and marched in the procession alongside her first group of first graders in May 2006. “To see the pride in the faces of those students that I participated in their high school graduation meant the world to me. Now my first group of babies are juniors in college,” added Wagner. “She’s unbelievably committed to taking care of kids, and she’s more than a classroom a teacher. She’s also extremely civically involved in church and other activities that help kids,” praised Dr. Brent. Last year, Wagner received the 12 Disciples Volunteer Award from St. Stanislaus Catholic Church of Anderson for outstanding volunteer work. She is also involved in education at St. Stanislaus as a volunteer Director of Religious Education and is in charge of the religious education program for 65 children, ages 4 to 18. Wagner was also instrumental in helping pass the $23 million dollar bond for A-S CISD. She says she took the mission of the group to a very personal level as a former K-12 grade student, a parent of two Anderson-Shiro students and as an employee of the district. “When the first bond for $22 million failed by 22 votes, I knew that I could have worked a little harder, talked to a few more people, sent a few more emails and maybe we could have been assured a victory,” Wagner added. Six months later, the volunteer group’s efforts paid off as the bond passed by 64 votes. As a reward for her part in helping, Dr. Brent granted Wagner permission to put her handprint in the concrete when the school’s foundation is laid. “I want my handprint to be covered by tile, carpet or whatever necessary so no one knows it’s there but me. I want to be able to say for a lifetime that my hand is in the foundation of life of every student that passes through the doors of Anderson-Shiro Consolidated Independent School District. That is my greatest reward,” said Wagner. Wagner’s other accomplishments include participation as a Texas Federation of Teachers member; UIL coach, 1994-present; PTA-PTO board member, 1995-present; parent-teacher coordinator, 1995-present; first grade team leader, 1999-present; GT coordinator, 2004-present; mentor teacher, 2005-present; high school cheerleading sponsor, 1995-1999; site-based decision making committee member; district advisory committee member; campus intervention team committee member; district leadership team committee member; Capturing Kids Hearts seminar participant and an Anderson-Shiro Alumni committee member. Wagner was recognized as Teacher of the Month at Anderson-Shiro Elementary in 1995 and Teacher of the Year (Chalkboard Award) from Planters Masonic Lodge 147 in 2002. Her community involvement includes volunteer work as a member of the Anderson-Shiro Young Farmers Booster Club, 2008 to present; Little Diggers volleyball assistant coach, 2007 to present; Girl Scout Troop, 2004 to present; 4-H, 2004 to present; Grimes County Youth Barbecue Cook-Off judge, 2003 to present and as Grimes County Fair committee chairman, 2002 to present.